If you are a timpanist this is the throne for you. 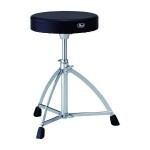 Designed as a timpani throne it is hydraulic and includes a back rest for those long rests between movements. 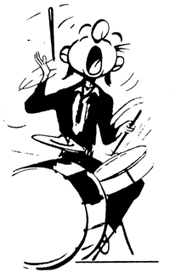 High enough to reach the drums and very comfortable. 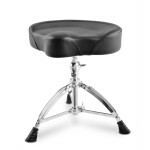 This has also been a popular throne for Upright bassists. This is a single braced leg throne designed for easy portability. It has a vinyl covered round cushion seat and slip proof height collar. It features a short tripod base. For those gigs when you need to relax your back because of strain this throne comes in handy. It has threaded spindle height adjustment with memory lock to secure your position and the saddle seat helps provide a free range of motion while playing. Stability is further provided by 4 legs with slip-proof rubber feet. 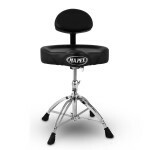 The Mapex Saddle Top Throne w/Back Rest-T775 is an easily adjustable throne with the advantage of a back rest. 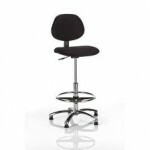 The saddle-style cushioned top makes this throne extremely comfortable. The top is 17" x 4" and has a raised center and back edge to help maintain the player's balance. The T-575A has a steel height adjustment tube with memory lock to assure security for anyone. If you are looking for a very affordable saddle-style throne this is the answer!